I don’t know what he’s talking about. Batman was always that goopy. 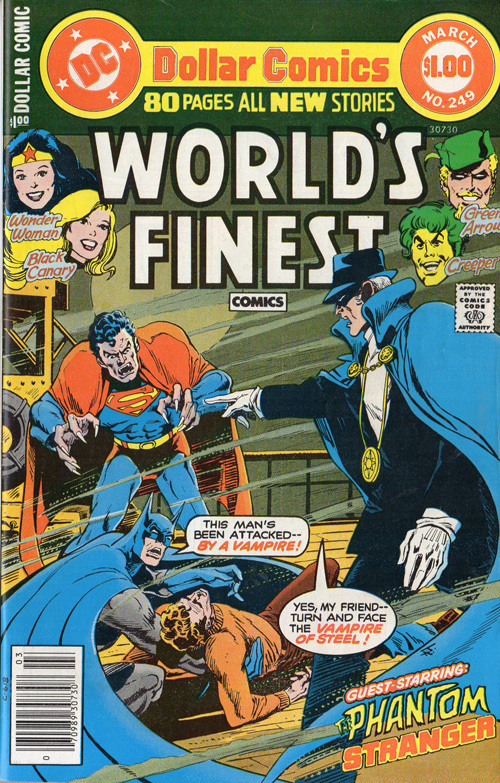 World’s Finest #248, DC Comics, January 1978. 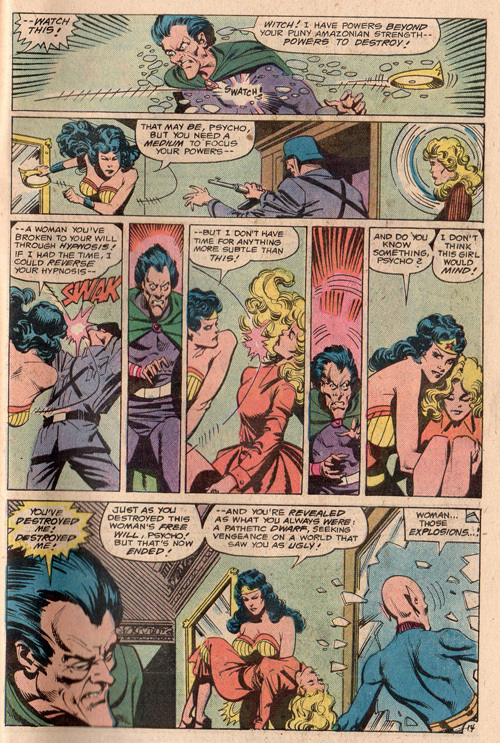 Let’s look back in on Wonder Woman’s back-up stories in World’s Finest in the late 1970s, when it was an 80-page “Dollar Comic” with other stories including the usual Superman/Batman team-up cover feature, Black Canary and Green Arrow, and the cowboy hero Vigilante. 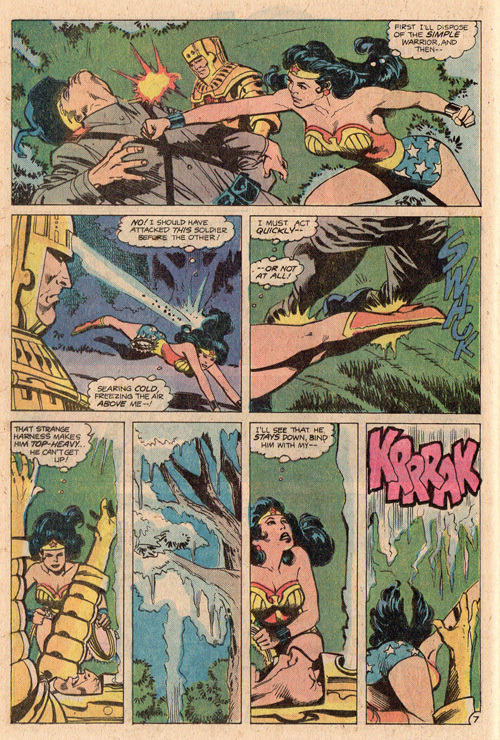 This issue is also a team-up for Wonder Woman, in which she meets DC’s most prominent war comics hero, Sgt. Rock. Although based in World War II, the hard-boiled soldier didn’t actually appear in comics until 1959, as an ongoing feature in Our Army at War—a comic that later changed its name to Sgt. Rock, running until 1988. That’s a long war. Rock was created by writer/editor Robert Kanigher, who was also the longtime scribe of Wonder Woman at the same time. 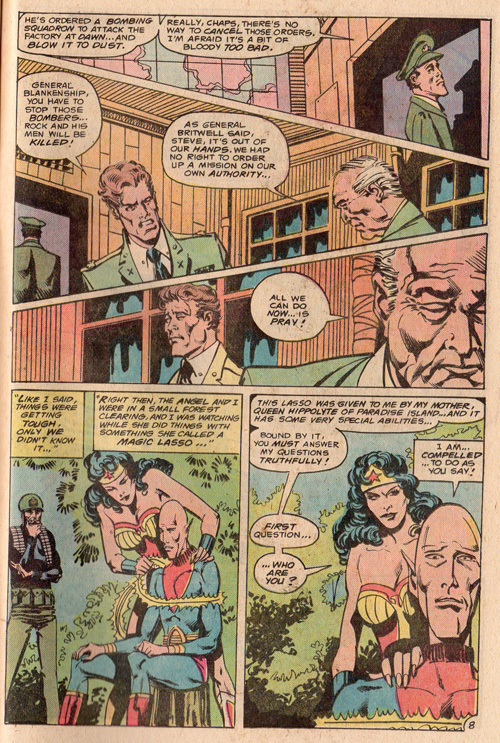 And with Wonder Woman comics in the late ’70s suddenly set during World War II again, to match the first season of the TV show, you’d think a team-up between them would be only natural, right? Well, you’d be wrong. I mean, there’s nothing implausible about the idea. 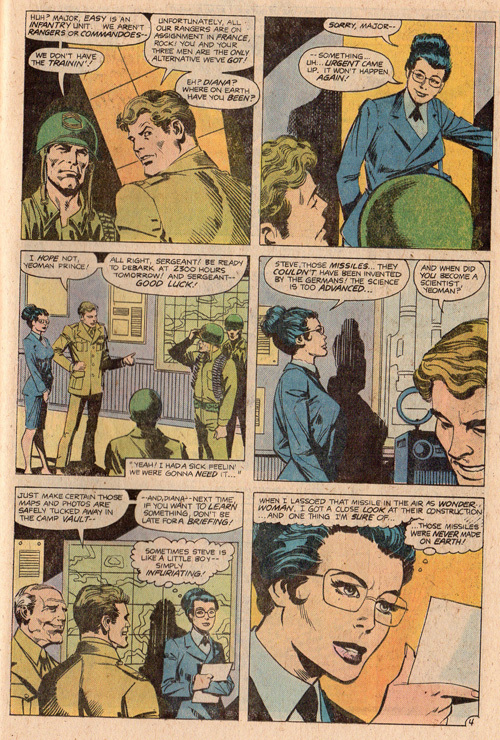 There were always a whole lot of soldiers in Wonder Woman comics back in the day, seeing as how she worked for army intelligence in her secret identity. The trouble is, when Wondy’s around, there’s not all that much for regular soldiers to do. The whole genre of war comics doesn’t work very well in a world where a superbeing in a brightly colored costume might always swoop in to save the day. It’s not like superhero team-ups with Sgt. Rock can’t work; Batman met him a number of times in The Brave & the Bold, but he doesn’t have superpowers. 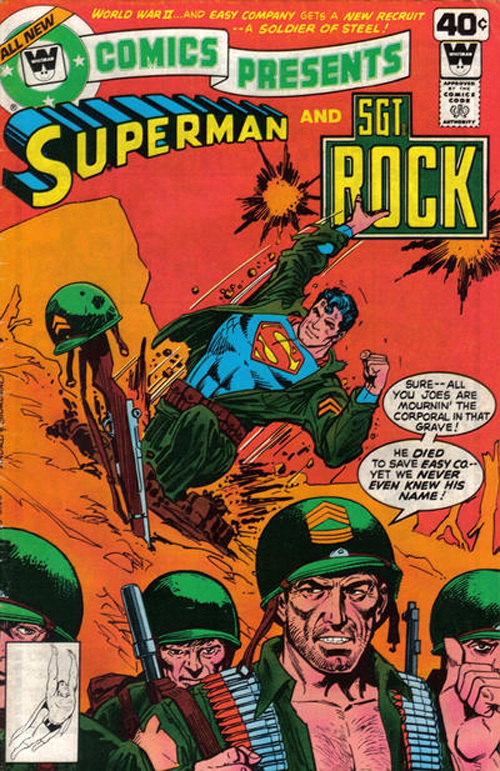 A slightly later story in DC Comics Presents really did it right, with an amnesiac Superman thrown back to World War II (on Earth-1, where there weren’t any superheroes in the 1940s) and joining Rock’s Easy Company as just another soldier. That way you could have a team-up without changing the soldiers’ whole sense of the world. Plus that’s just a really great image. This story, on the other hand, is set on Earth-2, where the actual 1940s stories of Wonder Woman, Superman et al. took place, so costumed adventurers are a known quantity. That also means this technically isn’t the same Sgt. Rock as the one in the war comics, but his duplicate in a parallel universe. I like the faux-Kubert shading on Rock’s face there. 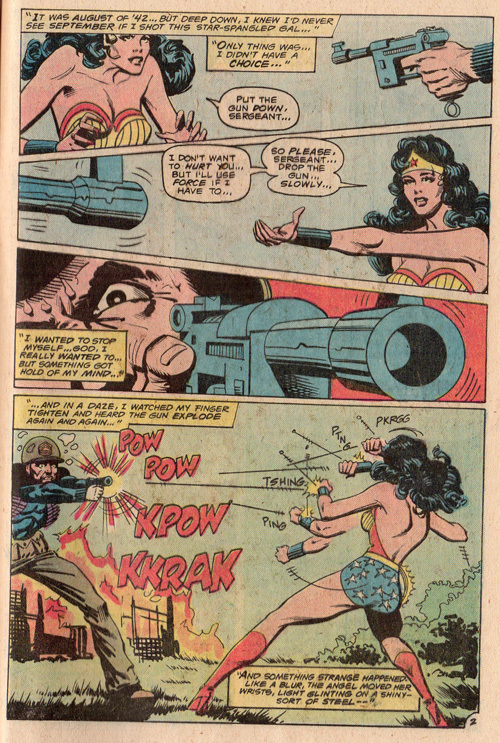 The Nazis have gotten hold of some kind of super-science weapon called a “guided missile”—crazy, I know—and Wonder Woman shows up out of the blue “like a lady cowboy sent by God” (to use Rock’s phrase) to take them out of action. Here Rock just happens to be reporting to Major Steve Trevor, Wonder Woman’s boyfriend, and General Blankenship, a character from her TV show recently imported into the comics. Steve sends Rock to destroy the factory where these missiles are being made, despite the fact that this isn’t really the kind of mission infantry men are usually sent on. She loves him because he’s so damn sexist. Diana knows that technology so amazingly advanced as a guided missile can’t possibly be from earth, so there have to be aliens involved somehow. And there are, but that’s only the half of it. Wonder Woman tags along on the mission from a distance, protecting Easy Company from the Nazis’ super-science weapons, such as some kind of ridiculous Mayan spaceman-looking armor that fires a freeze ray from the forehead. I don’t know what that’s supposed to be, but it doesn’t look comfortable. That all sounds pretty complicated. 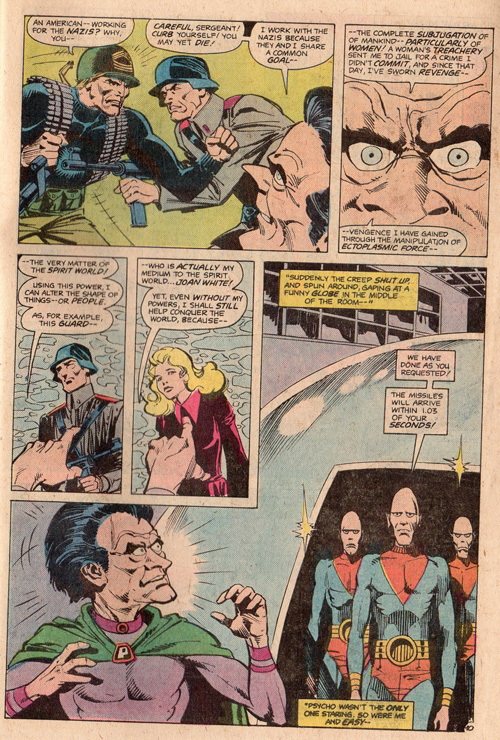 These tall, bald eggheaded aliens, with pinkish skin like Earth Caucasians, wear red and blue uniforms strangely reminiscent of Superman’s costume, right down to the red briefs over blue tights. That’s not a plot point, just an artistic oddity. Psycho captures Sgt. Rock and his men, and when Wondy comes to destroy the missiles and rescue them, what does that mind-controlling rascal do? Control Rock’s mind and tell him to kill her, of course! Will he kill her? Well, of course not. But that’s a suitable enough cliffhanger to take us to the next issue, a whole two months later! Goddamn, that’s a great cover. 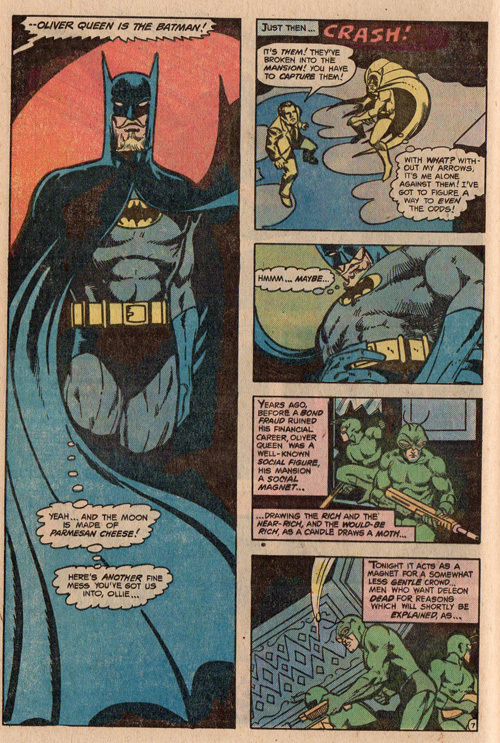 Nicely done, Jim Aparo. 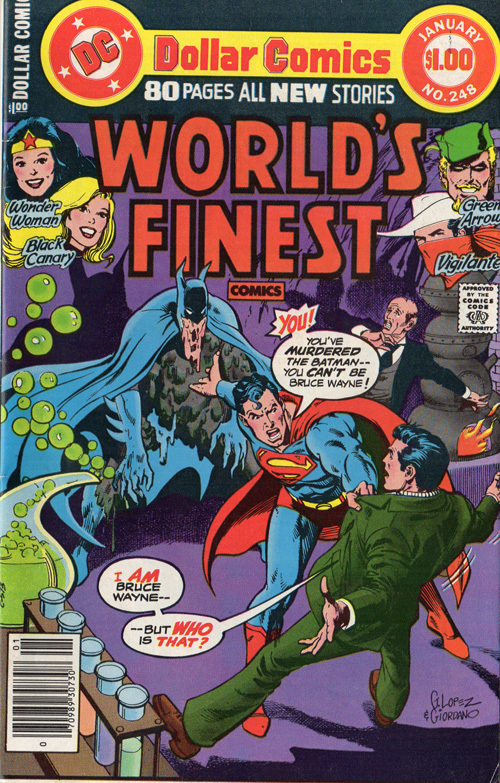 World’s Finest #249, DC Comics, March 1978. When we left off, a mind-controlled Sgt. Rock was about to shoot an Amazon warrior known for deflecting bullets with her bracelets. How do you think that’s going to go? Well, he does shoot, and she does deflect, then she punches him back to his senses. That’s what I call stopping a war with love. That’s why you don’t bring a gun to a bracelet fight. When he hears that his unreliably indirect plot to kill Wonder Woman didn’t work, Doctor Psycho uses his “ecto-plasmic” powers to convince three of his Easy Company prisoners—Bulldozer, Ice Cream Soldier and some other guy—that they’re rampaging cavemen, and he sics them on her. Nice little nod to Lovecraft there. Unbeknownst to our heroes, the British have arranged to bomb the factory where all this is going on, so the clock is ticking. This is explained, by the way, by a stereotypically posh English officer named, I kid you not, General Britwell. Just as Wonder Woman is convincing one of the aliens that she’s actually one of the good guys, Doctor Psycho is doing a pretty good job of convincing the Krell leader that they’ve made a terrible mistake, because this guy they’ve cast their lot with is a creep. He does this just by being himself, pretty clearly a horrible person. 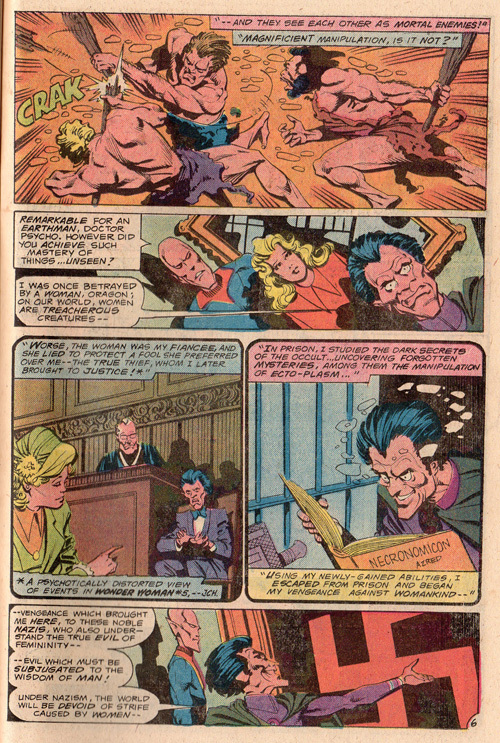 Then Wonder Woman shows up and defeats him by punching out the helpless woman he uses as a medium, Joan White. Somehow it seems like she could have accomplished the same thing with her lasso, but who am I to argue with violence? Speaking of violence, after all her talk in this story about how she hates guns and war, it’s a little jarring at the end to hear her talk about “the combat-happy joes of Easy,” but I guess Conway had to cram that catchphrase in there somewhere. So yeah, but another day for Rock and Easy Company in World War II, full of space aliens, supervillains, psychic mediums and star-spangled Amazon superheroines. I don’t want to talk about all the other stories in these two issues, though they’re pretty fun. The Batman/Superman one, as you can see on the cover, guest-stars the Phantom Stranger, which is always a treat, and issue 249 replaces the Vigilante stories with a run of Steve Ditko Creeper stories, which is pretty great also. But I do want to talk a little about the Green Arrow and Black Canary story, because it ties in with an observation I just made a couple weeks ago: People mock Clark Kent’s glasses disguise, but Green Arrow maintaining a secret identity was much more implausible. I mean, the blond hipster beard alone! And the guy was the freaking mayor for a while! And no sooner do I mention that than I reread this story (also by Conway) in which a business rival who’s ruined Oliver Queen financially and taken his old mansion discovers the former Arrowcave beneath it and comes to the obvious conclusion. Oliver Queen is no other than…Batman! I will treasure this image forever. I mean, the guy’s obviously crazy, but it’s pretty hilarious that the one bit of Batman’s face that you can actually see is the part that makes it pretty damn obvious not just that Oliver Queen isn’t Batman, but that he’s clearly Green Arrow. Nobody else looks like that. One thing I don’t particularly like is that these stories in World’s Finest started off as two separate but interlinked stories about Black Canary and Green Arrow, but soon became just one story in each issue with both of them. And from that point on, it was clearly really a Green Arrow story, with Black Canary in a supporting role. No wonder she gets fed up and walks away at the end of the story. 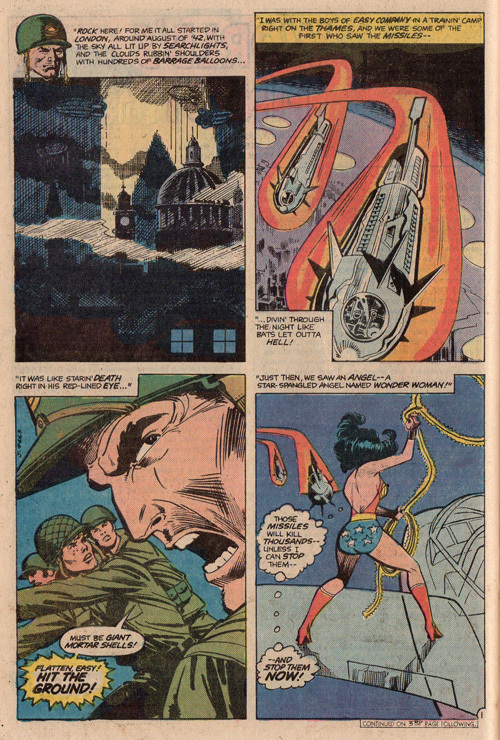 Anyway, like most Wonder Woman stories of the 1970s, this Sgt. Rock two-parter has never been reprinted.